6043 is a versatile, premium waterborne contact adhesive developed to provide excellent bonds when applied by conventional roll coaters and glue spreaders or by air or airless spray equipment. 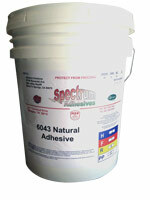 This adhesive may be used for bonding decorative laminates, plastics, flakeboard, plywood, etc. to desk counter and cabinet tops and for bonding a wide variety of skins and cores in laminated panel construction. It will not cause roll collapse when applied to expanded polystyrene core materials. 6043 adhesive can be used in post forming applications.